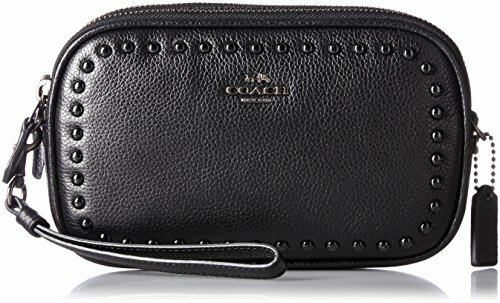 Coach Lacquer Rivets Ladies Small Leather Clutch Handbag 66154. Product Dimensions: 5in (H) x 8in (L) x 2in (W). Features two compartments with top zip closures, interior slip multifunction pockets, and removable wrist and crossbody straps. Black antique nickel hardware. Small sized black pebble leather clutch. Lacquer Rivets series. IMPORTANT WARRANTY INFORMATION: Please note that seller provides its own warranty for the products sold by seller. the manufacturer's warranty may not apply to products purchased from this seller. For additional warranty related issues or information, please contact us directly.